Clearing exist only in people’s memories, Stan’s is not only surviving, it’s thriving. Starting this month, the iconic Stan’s Barbershop, 6652 ½ W. Archer, is a six-day shop--open Mondays for possibly the first time ever, now that a second barber has been brought on by owner Josh Czarny. New, expanded hours are 9 a.m. to 6 p.m. Monday through Friday, 8 a.m. to 5 p.m. Saturdays. The new barber is John Hajewski, who most recently worked cutting hair at shops in the Loop and on the North Side. 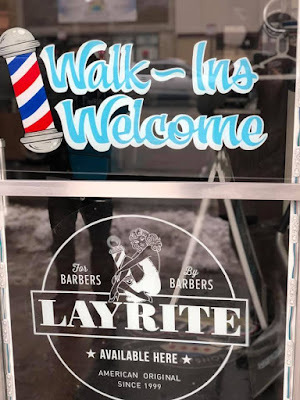 Hajewski specializes in straight-razor shaves, traditional men’s haircuts and fades—although he is versatile enough to handle a variety of requests. A native of suburban Bridgeview, Hajewski graduated from Wilkins Junior High School. Later he lived in the Archer Heights neighborhood while he attended St. Rita High School, where he graduated in 2006. After high school, he joined the Navy and served a four-year stint. Then it was on to a year at a barber school. New lettering on Stan's Barbershop's front window. While he has been at Stan’s for just a few weeks, he said he likes the mix of customers, young and old, as well as the “vintage feel” of the shop. Stan’s Barbershop was established in 1965 by Garfield Ridge resident Stan Podlasek. The shop got a new lease on life in late 2017 when Podlasek retired and Czarny, a 35-year-old Southwest Side native, picked up the shears and pumped new life into what has been one of the oldest and most liked businesses on the strip. Some of Stan’s is the same, most notably the teal-colored chairs, spinning barber pole and of course, the iconic blue-neon window sign. But other things are notably improved, such as new flooring and wall coverings that give the storefront a warmer feel. There also are two new wall-mounted TVs, a display of hair-care products and an eye-catching shop logo that incorporates Chicago’s municipal flag. A friendly message on Stan's Barbershop's front door. and old. Czarny himself has cut hair for customers of all ages, from a 10-month-old boy getting his first haircut to a 94-year-old man who has been coming to Stan’s for years. Services offered are similar to the traditional cuts offered by Stan Podlasek, with notable additions likes fades and other styles, as well as beard trims and hot-towel, straight-razor shaves.